FOURTH EXPEDITION TO FLORIDA IN 1567, COMMANDED BY THE CHEVALIER DE GOURGUES. Chevalier de Gourgues, a gentleman born in the country, near unto Bordeaux, incited with a desire of revenge to repair the honor of his nation, borrowed of his friends, and sold part of his own goods, to set forth, and furnish three ships, of indifferent burthen, with all things necessary — having in them an hundred and fifty soldiers, and four-score chosen mariners, under Captain Cazenove, his lieutenant, and Francis Bourdelois, master over the mariners. He set forth on the 22d of August, i567, and, having endured contrary winds and storms for a season, he at length arrived, and went on shore in the hie of Cuba. From thence he passed to the Cape of St. Anthony, at the end of the hie of Cuba, about two hundred leagues distant from Florida, where the captain disclosed unto them his intention, which hitherto he had concealed from them, praying and exhorting them not to leave him, being so near the enemy, so well furnished, and in such a cause; which they all sware unto him, and that with such courage, that they would not stay the full moon to pass the channel of Bahama, but speedily discovered Florida, where the Spaniards saluted him with two cannon-shot from their fort, supposing that they had been of their nation; and Gourgues saluted them again, to entertain them in this error, that he might surprise them at more advantage, yet sailing by them, and making as though he went to some other place, until he had sailed out of sight of the place; so that, about evening, he landed fifteen leagues from the fort, at the mouth of the river Tacatacouru, which the Frenchmen called Seine, because they thought it to be like the Seine, in France. Afterward, perceiving the shore to be covered with savages, with their bows and arrows (besides the sign of peace and amity which he made them from his ships), he sent his trumpeter to assure them that they were come thither for none other end but to renew the amity and ancient league of the French with them. The trumpeter did his message so well (by reason he had been there before, under Laudonniere), that he brought back from King Satourioua (the greatest of all the other kings) a kid, and other meat, to refresh us, besides the offer of his friendship and amity. Afterward, they retired, dancing, in sign of joy, to advertise all the kings (Satourioua’s kinsmen) to repair thither the next day, to make a league of amity with the Frenchmen. Whereupon, in the meanwhile, our general went about to sound the channel of the river, to bring in his ships, and the better to traffic and deal with the savages, of whom the chiefs, the next day, in the morning, presented themselves — namely, the great King Satourioua,Tecatacourou, Halmacanir, Athore, Harpaha, Helma- I 567′ cape, Helicopile, Molloua, and others, his kinsmen and allies, with their accustomed weapons. Then sent they to entreat the French general to come on shore, which he caused his men to do, with their swords and harquebuses, which he made them leave behind them, in token of mutual assurance, leaving his men but their swords only, after that the savages, complaining thereof, had left, and likewise sent away their weapons at the request of Gourgues. This done, Satourioua, going to meet him, caused him to sit on his right hand, in a seat of wood of Untisque, covered with moss, made of purpose like unto his own. Then two of the eldest of the company pulled up the brambles and other weeds which were before them, and, after they had made the place very clean, they all sat round about them on the ground. Afterward, Gourgues, being about to speak, Satourioua prevented him, declaring at large, unto him, the incredible wrongs and continual outrages that all the savages, their wives, and children had received of the Spaniards since their coming into the country, and massacring of the Frenchmen, with their continual desire, if we would assist them, thoroughly to revenge so shameful a treason, as well as their own particular griefs, for the firm good will they always had borne unto the Frenchmen. Whereupon Gourgues, giving them his faith, and making a league between them and him with an oath, gave them certain presents of daggers, knives, looking-glasses, hatchets, rings, bells, and such other things, trifles unto us, but precious unto these kings; which, moreover, seeing his great liberality,demanded, each one, a shirt of him, to wear only on their festival days, and to be buried in at their death. Which things, after that they had received, and Satourioua had given in recompense to Captain Gourgues two chains of silver grains which hung about his neck, and each of the kings certain deer-skins, dressed after their manner, they retired themselves, dancing and very jocund, with promise to keep all things secret, and to bring unto the said place good companies of their subjects, all well armed, to be avenged thoroughly on the Spaniards. In the meanwhile, Gourgues very narrowly examined Peter de Breborn, in Newhaven, which, being but a young stripling, escaped out of the fort into the woods, while the Spaniards murdered the rest of the French, and was, after wards, brought up with Satourioua, which, at that time, bestowed him on our general, whose advice stood him in great stead ; whereupon he sent to discover the fort, and the estate of the enemies, by certain of his men, being guided by Olotacara (Satourioua’s nephew), which he had given him for this purpose, and for assurance of Estampes, a gentleman of Cominges, and others, which he sent to descry the state of the enemies. Moreover, he gave him a son of his, stark naked, as all of them are, and his wife, which he loved best of all the rest, of eighteen years old, apparaled with the moss of trees, which, for three days’ space, were in the ships, until our men returned from descrying the state of the enemy, and the kings had furnished their preparation at their rendezvous. Their marching being concluded, and the savages’ rendezvous being appointed them beyond the river Salinacani (of our men called Somme), they all drank, with great solemnity, their drink, called cassine, made of the juice of certain herbs (as they are wont to do when they go to any place of danger), which hath such force, that it taketh from them hunger and thirst for twenty-four hours, and Gourgues was fain, as though he drank, thereof, for company. Afterward, they lifted up their hands, and sware all, that they would never forsake him; Olotocara followed him, with pike in hand. Being all met at the river Sarauahi (not without great trouble, by reason of the rain and places full of water, which they must needs pass, which hindered their passage), they were distressed with famine — finding nothing, by the way, to eat, their bark of provision being not arrived, which was to come unto him from the ships, the over sight and charge whereof he had left unto Burdelois, with the rest of the mariners. 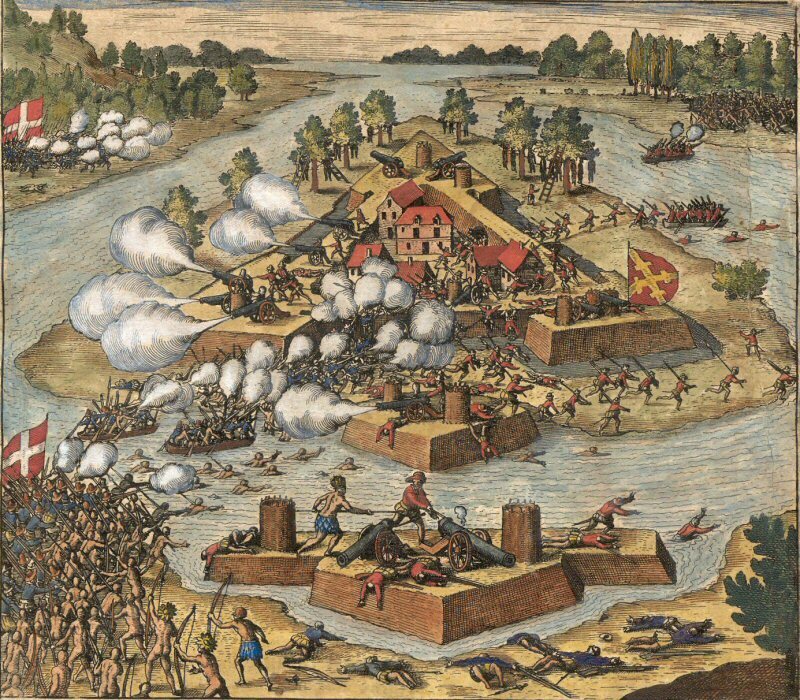 Now, he had learned that the Spaniards were four hundred strong, being divided into three forts, builded and flanked, and well fortified upon the River of May — the great fort, specially began by the French, and, afterward, repaired by them, upon the most dangerous and principal landing-place, whereof, two leagues lower, and nearer toward the river’s mouth, they had made two smaller forts, which were defended — the river passing between them, with six-score soldiers, good store of artillery, and other munition, which they had in the same. From Saracary, unto these small forts, was two leagues’ space, which he found very painful, because of the bad ways and continual rain. Afterward, he departed from the river Catacouru, with ten shot, to view the first fort, and to assault it the next day, in the morning, by the break of day, which he could not do, because of the foul weather and darkness of the night. King Helicopile, seeing him out of quiet, in that he had failed of his purpose there, assured him to guide him a more easy way, though it were farther about ; insomuch, as leading him through the woods, he brought him within sight of the fort, where he discerned one quarter, which was but begun to be entrenched. Thus, after he had sounded the small river that falleth down thereby, he staid until ten of the clock in the morning, for an ebb-water, that his men might pass over there unto a place where he had seen a little grove, between the river and the fort (that he might not be seen to pass, and set his soldiers in array), causing them to fasten their stalks to their morions, and to hold up their swords and kalivers in their hands, for fear lest the water, which reached up to their girdles, should not wet them, where they found such abundance of great oysters and shells, which were so sharp, that many had their legs cut with them, and many others lost their shoes. Notwithstanding, as soon as they were passed over, with a French courage, they prepared themselves for the assault, on the Sunday eve next after Easter-day, in April, i568. Inso much, that Gourgues, to employ the ardent heat of this good affection, gave twenty shot to his lieutenant (Cazenove), and ten mariners, laden with pots and balls of wild-fire to burn the gate, and then he assaulted the fort on another side, after he had made a short speech unto his men of the strange treasons which the Spaniards had played their companions. But, being descried as they came, holding down their heads, within two hundred paces from the fort, the gunner, being upon the terrace of the fort, after he had cried “Arm! arm! these be French men!” discharged twice upon them a culverin, whereon the arms of France were graven, which had been taken from Lau- donnierc; but, as he went about to charge it the third time, Olotocara, which had not learned to keep his rank, or, rather, moved with rage, leapt on the platform, and thrust him through the body with his pike, and slew him. Whereupon Gourgues advanced forward, and, after he had heard Cazenove cry that the Spaniards, which issued out armed at the cry of the alarm, were fled, he drew to that part, and so hemmed them in between him and his lieutenant, that, of three-score, there escaped not a man, saving only fifteen, reserved unto the same death which they had put the French unto. The Spaniards of the other fort, in the meanwhile, ceased not to play with their ordnance, which much annoyed their assailants — although to answer them, they had, by this, placed, and oftentimes, the four pieces found in the first fort. Whereupon Gourgues, being accompanied with four-score shot, went aboard the bark, which met him there to good purpose, to pass into the wood near unto the fort, out of which he supposed the Spaniards would issue, to save themselves, through the benefit of the woods, in the great fort, which was not past one league distant from the same. Afterward, the savages, not staying for the return of the bark, leapt all into the water, holding up their bows and arrows in one hand, and swimming with the other, so that the Spaniards, seeing both the shores covered with so great a number of men, thought to flee towards the woods; but, being charged by the French, and, afterwards, repulsed by the savages, towards whom they would have retired, they were sooner, than they would, bereft of their lives. To conclude, they all there ended their days, saving fifteen of those, which were reserved to be executed for the example of others. Whereupon, Captain Gourgues, having caused all that he found in the second fort to be transported unto the first, where he meant to strengthen himself to take resolution against the great fort, the state, whereof, he did not understand ; in fine, a serjeant of a band, one of the prisoners, assured him that they might be there very near three hundred, well furnished, under a brave governor, which had fortified there, attending further succors. Thus, having obtained of him the platform, the height, the fortification, and passages unto it, and, having prepared eight good lathers, and raised all the country against the Spaniards, that he might not have news, nor succors, nor retreat, on any side, he determined to march forward. In the meanwhile, the governor sent a Spaniard, disguised like a savage, to spy out the state of the French ; and, though he were discovered by Olotocara, yet he used all the cunning he could possibly to persuade them that he was one of the second fort, out of which having escaped, and, seeing none but savages on every side, he hoped more in the Frenchmen’s than their mercy, unto whom he came to yield himself, disguised like a savage, for fear lest, if he should have been known, he should have been massacred by those barbarians. But the spy, being brought face to face with the serjeant of the band, and convicted to be one of the great fort, was reserved until another time, after that he had assured Gourgues, that the bruit was, that he had two thousand Frenchmen with him, for fear of whom the two hundred and three-score Spaniards, which remained in the great fort, were greatly astonished. Whereupon Gourgues, being resolved to set upon them while they were thus amazed, and, leaving his standard-bearer and a captain, with fifteen shot, to keep the fort and the entry of the river, he caused the savages to depart by night, to lay in ambush within the woods, on both sides of the river ; then he departed in the morning, leaving the serjeant, and the spy, fast bound, along with him, to show him that, indeed, which they had only made him understand before, by painting. As they marched, Olotocara, a resolute savage, which never left the captain, said unto him, that he had served him faithfully, and done whatsoever he had commanded him ; that he was assured to die in the conflict at the great fort ; wherein, nevertheless, he would not fail, though it were to save his life ; but he prayed him to give unto his wife, if he escaped not, which he had meant to bestow on him, that she might bury the same with him, that thereby he might be better welcome unto the village of the souls, or spirits de parted. To whom Captain Gourgues answered, that he had commended his faithful valor, the love towards his wife, and his noble care of immortal honor; that he desired rather to honor him alive than dead ; and that, by God’s help, he would bring him home again with victory. After the discovery of the fort, the Spaniards were no niggards of their cannon-shot, nor of two double culverins, which, being mounted upon a bulwark, commanded all along the river, which’ made Captain Gourgues to get to the hill covered with wood, at the foot whereof the fort beginneth, and the forest, or wood, continueth and stretcheth forth beyond it, so that he had sufficient coverture to approach thereunto, without offence. He purposed, also, to remain there until the morning, wherein he was resolved to assault the Spaniards, by scaling their walls, on the side toward the hill, where the trench seemed not sufficiently flanked for the defence of the courtains, and from whence part of his men might draw them that were besieged, which should show themselves, to defend the rampart, while the rest were coming up. But the governor hastened his unhappy destiny, causing three-score shot to sally forth, which, passing through the trenches, advanced forward, to descry the number and valor of the French : whereof twenty, under the conduct of Cazenove, getting between the fort and them, which now were issued forth, cut off their repassage, while Gourgues commanded the rest to charge them in the front, but not to discharge, but near at hand, and so that they might be sure to hit them — that afterward, with more ease, they might cut them in pieces with their swords ; so that, turning their backs as soon as they were charged, and compassed in by his lieutenant, they remained all slain upon the place ; whereat the rest that were besieged were so astonished, that they knew no other means to save their lives but by fleeing into the woods adjoining ; where, nevertheless, being encountered again by the arrows of the savages, which lay in wait there for them (whereof one ran through the target and body of a Spaniard, which therewithal fell down stark dead), some were constrained to turn back, choosing rather to die by the hand of the French, which pursued them — assuring themselves that none of them could find any favor, neither with the one nor the other nation, whom they had, alike, and so out of measure, cruelly entreated — saving those which were reserved to be an example for the time to come. The fort, when it was taken, was found well provided of all necessaries ; namely, of five double culverins, and four mynions, with divers other small pieces, of all sorts, and eighteen gross cakes of gunpowder ; all sorts of weapons, which Gourgues caused, with speed, to be embarked, saving the powder and other moveables, by reason it was all consumed by fire, through the negligence of a savage, which, in seething of his fish, set fire on a train of powder, which was made and holden by the Spaniards, to have feasted the French, at the first assault, thus blowing up the storehouse, and the other houses, built of pine trees. Afterwards, considering he had not men enough to keep his forts which he had won, much less to store them, fearing, also, lest the Spaniards, which hath dominions near adjoining, should renew his forces, or the savages should prevail against the Frenchmen, unless his Majesty would send thither, he resolved to raze them. And, indeed, after he had assembled, and, in the end, persuaded all the savage kings so to do, they caused their subjects to run thither with such effect, that they overthrew all the three forts flat, even with the ground, in one day. This done by Gourgues, that he might return to his ships, which were left in the River of Seine, called Tacatacourou, fifteen leagues distant from thence, he sent Cazenove and the artillery by water ; afterward, with four-score harquebusiers, armed with corselets, and matches lit, followed, with forty mariners, bearing pikes, by reason of the small confidence he was to have in so many savages, he marched by land, always in battle array ; finding the ways covered with savages, which came to honor him with presents and praises, as the deliverer of all the countries round about adjoining. 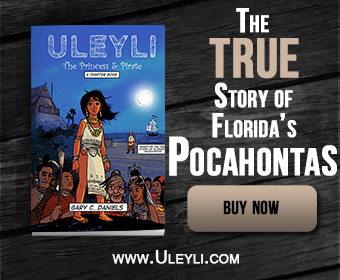 An old woman, among the rest, said unto him, that now she cared not any more to die, since she had seen the Frenchmen once again in Florida, and the Spaniards chased out. Briefly, being arrived, and finding his ships set in order, and everything ready to set sail, he counseled the kings to continue in the amity and ancient league which they had made with the King of France, which would defend them against all nations ; which they all promised, shedding tears because of his departure — Olocotara especially; for appeasing of whom, he promised them to return within twelve moons (so they count the year), and that his King would send them an army, and store of knives for presents, and all other things necessary. So that, after he had taken his leave of them, and assembled his men, he thanked God of all his success since his setting forth, and prayed to Him for a happy return. The 3rd day of May, 1568, all things were made ready, the rendezvous appointed, and the anchors weighed to set sail so prosperously, that, in seventeen days, they ran eleven hundred leagues, continuing which course, they arrived at Rochelle the 1st of June, the thirty-fourth day after their departure from the River of May, having lost but a small pinnace, and eight men in it, with a few gentlemen, and others, which were slain in the assaulting of the forts. After the cheer and good entertainment which he received of those of Rochelle, he sailed to Bordeaux, to inform M. Monluc of the things above mentioned; albeit, he was advertised of eighteen pinnaces, and a great ship of two hundred tons, full of Spaniards, which, being assured of the defeat in Florida, and that he was at Rochelle, came as far as Che-de-Bois the same day that he departed thence, and followed him as far as Blay (but he was gotten already to Bordeaux), to make him yield another account of his voyage than that wherewith he made many Frenchmen right glad. The Catholic king, being after ward informed that Gourgues could not easily be taken, offered a great sum of money to him that could bring him his head ; praying, moreover, King Charles to do justice on him, as of the author of so bloody an act, contrary to their alliance and good I567 league of friendship. Insomuch as, coming to Paris to present himself unto the King, to signify unto him the success of his voyage, and the means which he had to subdue this whole country unto his obedience (wherein he offered -to employ his life and all his goods), he found his entertainment and answer so contrary to his expectation, that, in fine, he was constrained to hide himself a long space in the Court of Roanne, about the year 1570; and, without the assistance of President Marigny, in whose house he remained certain days, and of the Receiver of Vacquieulx, which always was his faithful friend, he had been in great danger; which grieved not a little Dominique de Gourgues, considering the services which he had done, as well unto him as to his predecessors, kings of France. He was born in Mount Marsan, in Guyenne, and employed for the service of the most Christian kings in all the armies made since these twenty-five or thirty years. At last, he had the charge and honor of a captain, which, in a place near unto Seine, with thirty soldiers, sustained the brunt of a part of the Spanish army, by which, being taken in the assault, and having all his men cut to pieces, he was put into a galley, in token of the good war and singular favor which the Spaniard is wont to show us; but, as the galley was going toward Sicily, being taken by the Turks, led away to Rhodes, and thence to Constantinople ; it was shortly afterward recovered by Romeguas, commander over the army of Malta. By this means, returning home, he made a voyage on the coast of Africa, whence he took his course to Brazil, and to the South Sea. At length, being desirous to repair the honor of France, he set upon Florida, with such success as you have heard. So that, being become, by his continual warlike actions, both by land and sea, no less valiant captain than skillful mariner, he hath made himself feared by the Spaniards, and acceptable unto the Queen of England, for the desert of his virtues. To conclude, the Chevalier de Gourgues died in the year 1582, to the great grief of such as knew him.